Those who may recall the massive object hovering over Salta in Argentina will be astonished to hear that one of the most dramatic UFO sightings of 2009 has returned, and this time in broad daylight. This information comes as a surprise to all ground parties involved, particularly the Saltans who had electrical disturbances accompany the sighting. 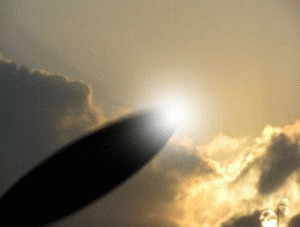 On Tuesday, the 15th the cigar-shaped object appeared in the sky above the province of Salta in front of at least several hundred and possibly as many as thousands of witnesses who reported it to various UFO organizations globally. The object's appearance was connected to several hundred cases of electrical disruptions with particular attention to cell phone use as cell phones essentially became useless as witnesses scrambled to contact loved ones and authorities to report the object's return. But the object was not merely hovering idly above astonished witnesses who watched as it maneuvered incredibly fast performing speeds that easily surpassed those feasible by the most advanced Earthly aircraft. Witnesses described the craft as being identical in shape and nearly identical in behavior to the craft witnessed earlier this month over the same area. Those involved in the phone maintenance could find no problem with the shutdown of their communication infrastructure, lending to the troubling nature of this case. The metallic object has gained local celebrity status ever since it was first spotted at the end of last month in the middle of the night. For those who are unfamiliar with the first sighting, on the 26th of November an object was spotted hovering above Salta at around 1:00 AM. The object, which was witnessed by hundreds who were outside unable to sleep in the unseasonably hot night moved over the town and toward a power station resulting in a mass blackout for several miles around the area. There was no explanation as the power equipment was checked, and just as mysteriously as it had appeared the object quickly vanished heading southwest. Soon after the power came back on inexplicably, leading many assembled engineers to throw their hands in the air unable to trace the mysterious problem. It has been speculated that an EMP could have caused an electrical disruption of this nature, even frying circuit boards and possibly even causing small fires without actually hurting any of the population below. Could the object over Salta have been an experimental aircraft by some unknown government agency? Or was it from another world? The object was also allegedly spotted a few weeks later in Texas by an observer who reported his sighting to the Mutual UFO Network (MUFON). Regardless of the source, the motivation of this case seems to be a sort of test. First the electrical grid is tested in a relatively isolated area, then communication. It doesn't seem to matter what's causing these disruptions. Many have speculated the object could have been a massive blimp of Earthly design equipped with an Electro-magnetic pulse disruption device. If this is a test, it seems to warrant some investigation. Many of our articles are written by my trusted writers. Visit http://www.unexplainable.net for more articles!